Paul Aden of New York introduced this large size (26 inches high) cultivar in 1980. It is green with multicolor streak variegation. White, bell-shaped flowers are borne on a 32 inch scape. It is a hybrid of H. 'Fascination' × H. 'Intrigue'. According to The Hostapedia by Mark Zilis (2009), "The registration description of 'Color Glory' does not match the plant being sold in the nursery trade. The registered plant probably no longer exists, while the gold-centered H. 'Sieboldiana'-type can be commonly found. The latter appears to be the same as 'Borwick Beauty'." As mentioned above, the plant commonly sold as H. 'Color Glory' is not the same as the one registered under that name. The Genus HOSTA by W. George Schmid (1991) lists the descriptions; 1) as they appear in the registration for The American Hosta Society and 2) the traits of the plant being sold. An article about H. 'Forncett Frances' by Warren I. Pollock in The Hosta Journal (1996 Vol. 27 No. 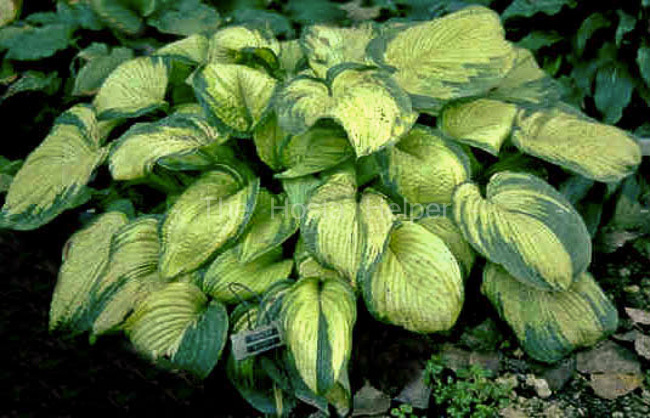 1) states that, "This hosta was found at the Four Seasons nursery in St. Mary, Norwich, Norfolk, England...The leaves of 'Forncett Frances' are not as bright as those of 'Color Glory' (Aden) which is a sport of 'Frances Williams' and also having this hosta's reversed variegation." Doesn't have leaves that exhibit the undesirable characteristic called "burning," "scalding," "browning," or "rusting" as does 'Color Glory' (a.k.a., 'Borwick Beauty'), which also is a sport with a bold bue-green border of H. 'Elegans'.